To some extent, two-times Hero of the Soviet Union Talgat Bigeldinov (Талғат Бигелдинов, 1922-2014) can be rightfully compared to famous US aviator Charles Lindbergh (1902-1972). They both retired as colonels. They both lost their sons, who fell victims to criminal activities. In 1932, Lindbergh’s baby son was kidnapped and murdered. In 2006, a 47-year-old passenger robbed and murdered Bigeldinov’s 60- year-old son, who moonlighted as a taxi driver. The US pilot made some 50 operational flights during WWII. The Kazakh made some 305 operational flights with his attack plane during WWII. He brought down four Nazi warplanes. In order to conduct aerial survey, Talgat Bigeldinov carried out the first Soviet hedgehopping flight over Berlin – the capital of the Third Reich (bit.ly/1y8cDMh). His bravery was awarded accordingly. 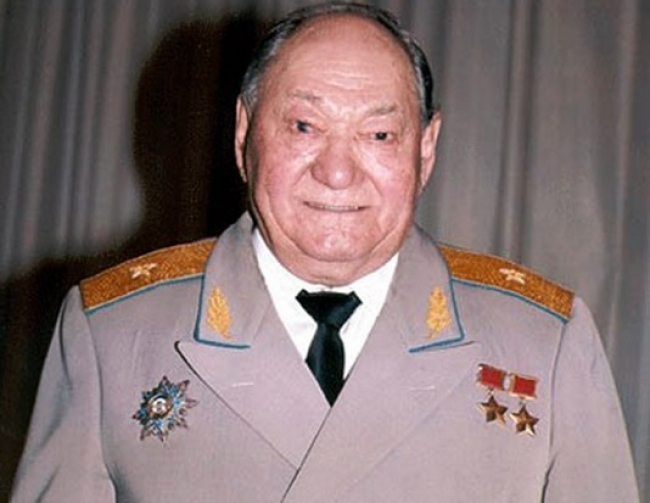 He was the only Kazakh to receive twice the highest military award in the USSR – Hero of the Soviet Union. He was the last two-times Hero alive, who received these awards for WWII’s exploits. Kazakh people respected him deeply. He became a Major General of the Kazakh Air Forces. During his lifetime, several streets in our cities were named in his honor. A military institute in Aqtobe also proudly bears his name. However, Russian mainstream media have not informed their audience about his demise. Leading journalists of Belarus and Ukraine also have unnoticed this sad news. Meanwhile, heroic action of Talgat Bigeldinov served mainly to defend these Slavic republics against Hitler’s invasion. Ungrateful Slavs and Jews in major media outlets have not found an opportunity to pay tribute to our great compatriot. Xenophobic movements in the Slavic states have thrived due to such ignorant information policy, too. The late warrior fought Nazis gallantly. He prevailed. Nevertheless, propaganda vehicles in the Slavic regions have yielded substantially to poisonous dogmas of Nazism.